The Cooking Actress: James-11 Months! Uhhhh I'm freaking out. Next month my baby will be turning ONE WHOLE YEAR OLD. HOW, HOWWWW???? Also, I turned 29 yesterday so I'm struggling with a lot of "where did the time go" feelings. Sleeping Pattern: The same as the last 2 months. James takes 2 naps during the day that usually total between 2 and 3 hours and then he sleeps about 10.5-11 hours at night. He usually does really well unless something is disrupting him but he does pretty darn great. Eating Habits: Still nursing 4 times a day, he's definitely getting really antsy and distracted during most of his feedings so I can see that we're moving towards weaning soon (I'm planning on doing it slowly, though). He's super loving table food, still. AND he's finally come around to vegetables! Yay! He's completely able to use and scoop with a spoon and he's starting to get the hang of a fork. It's amazing how much that little boy can eat when he wants to! It's also amazing the giant messes he can make, ha. The worst is when he puts his dirty hands in his hair (frequently making eye contact with you and slowly making his hair stick up with gunk as you gawk and say "noooooo....") Also, for some reason, he sometimes shoves his food down by his right leg. I have no idea why. It's very weird, and very messy. Development & Firsts: OMG every month is full of huge firsts lately! 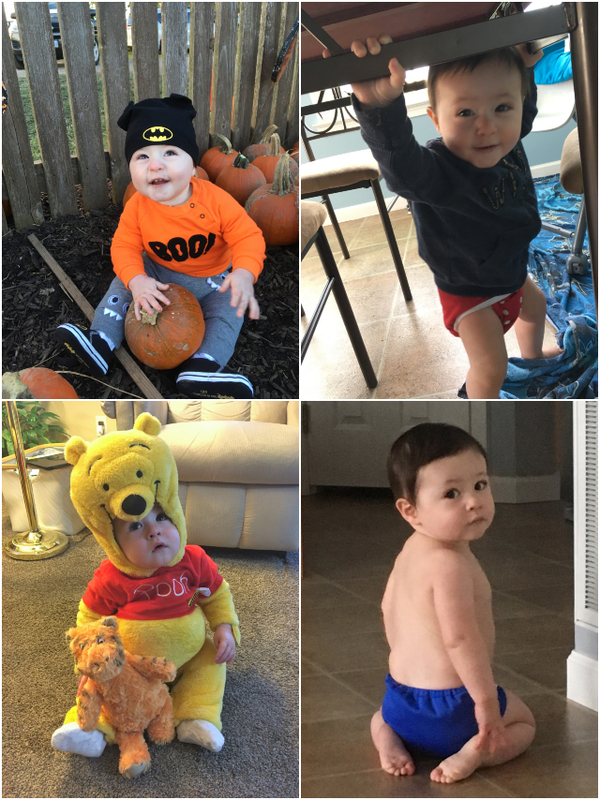 James got a 6th tooth (top lateral left incisor), went to his first pumpkin patch, met his dog "cousin" Millie for the first time, had his first Halloween (he was Winnie the Pooh), and HE TOOK HIS FIRST STEPS! On November 6th my big boy was standing on his own in the kitchen (he can pull himself to standing on pretty much anything, he's a world class stander at this point) and doing so well and standing for so long that I told Michael to look. Not long after that, James took 4 steps! We were so lucky we both got to be here to see it! Since that time little guy has only taken the occasional step or two but I sense he's working on it. Other than that, he's just understanding so much of what we say and talking a ton. Mischief: James will let you know when he does not like something-at the least he'll shout at you and make an angry face or maybe whine, at the worst he'll freak out and scream as if you are causing him physical harm. His poor aunt Shannan experienced the latter for the 1st time while babysitting and trying to change his diaper (how dare she!) and felt awful. Every single time you change his clothes or diaper he will crawl away from you-frequently naked as a jaybird. It's pretty adorable actually, but his squirminess while trying to change him can get pretty frustrating also. Sometimes the crawling away becomes a funny game and he giggles and crawls as fast as possible away from you. He can and will get into anything and everything and generally protests at being taken away from things he shouldn't be into. He also has gotten sneaky about trying to get stuff he shouldn't. One time he positioned his pack n play (because he can move it, weirdly strong baby) so that Michael's view of him was blocked and he couldn't see him trying to hang on the vacuum cleaner. Anytime he knows I'm not looking he will speed crawl towards one of the areas I don't let him play in. James also likes to pretend he wants to share food with his daddy, then he'll last minute take the food back and giggle (he never does this with me, he just shares the food and doesn't fake me out lol). He still has this face and this smile that he'll make when he's feeling sly. It's sort of insane how mischievous he can be. But like he's still so sweet so, it's mostly ok lol. Cuteness: Oh my cutie cutie cutie. James is still so sweet and gives big kisses (when he decides he wants to). Sometimes we'll just be sitting and reading, he'll sometimes be holding my hand (ah!) and then he'll raise his head up, grab your face, and give you a big smackeroo (he gave Michael one of these the other day and he just melted). Speaking of reading, James has gotten SO into books this last month. He wants you to just read and read and read to him. He just lights up and is so attentive and it's crazy (he learned how to do all the parts of the Pat the Bunny book after reading it like twice). 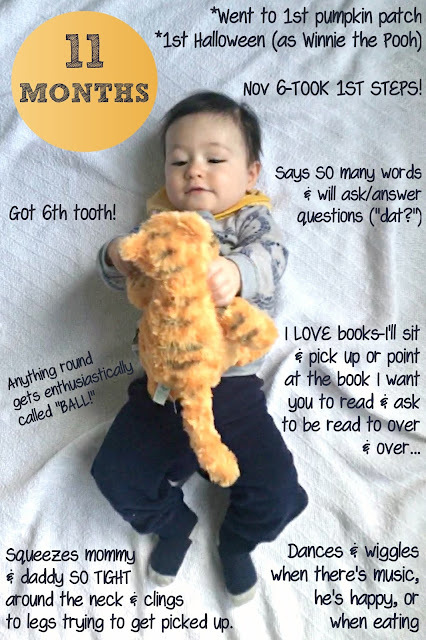 He'll sit down and pick up a book and hold it for you, or you'll say "What do you want to read?" and he'll point or pick a book up. He's also started giving big tight squeezes around the neck this month, which we LOVE. If I get him from the crib and he's standing and I kneel to be on his level he'll wrap his arms around my neck. And he's just gotten even more attached to Michael and I, if that's even possible. He gets displeased when one (or both) of us leaves and is SO happy when we come home. He can also be a bit clingy which-although sometimes difficult-is so sweet. I'll be trying to cook in the kitchen, or something, and he'll pull himself to standing on my legs and hang there, holding them, wanting to be picked up and paid attention to. He's just so insanely interactive, how much conversation we're already starting to be able to have. And he's just always learning-he'll point to things and say "dat?" because he wants to know what it is. He'll cheers his food with yours-it's so adorable just how much he adores food-he LOVES it. He'll do a little happy dance when he's getting to eat, particularly things he's really into. He'll also do a little happy wiggle/dance on his own when there's music of pretty much any sort (whether I'm singing, Michael and I are playing The Greatest Showman soundtrack for the umpteenth time, or he pushed the song button on his Somebunny Loves You book). He's always making the funniest faces and doing the funniest things. He started doing this faux-angry sniffing which we were confused about where it came from at first until I realized Michael loves to get in his face and do that little "angry" sniff also so, of course, he always has to copy his daddy (and apparently Michael did the same thing when he was little). He also has started smacking his lips when he has an inkling food might be around, lol. This has also evolved into clicking his tongue and he'll do it pretty much anytime and it's crazy cute. And he'll wiggle his tongue in his mouth and make a like "wawawa" sound for some reason, I have no idea why but it makes me laugh. Anytime James sees his reflection he likes to kiss it (this results in a lot of lip-prints on the glass door we have that goes out to the deck, also on the window of the oven). He still loves Batman and gets insanely stoked when he sees anything with him on it and will yell "Ba!" and the same also applies to balls-anything round is a ball (picture of the moon, picture of the sun, my dad's bald head...) and he will enthusiastically call "BALL!" He now has 2 balls that he loves to play with. It's funny, the ball thing started at the pumpkin patch-he played with a tether-ball and ever since everything has been a ball, including when he picked out his pumpkin (which he legit pointed to and said "ball." like "yes, this is the ball I want.") Feet are hilarious to him thanks to the stinky footsie game and he loves to hold up his foot or a sock or just about anything for you to sniff and then act like it's stinky. Kills him. I don't know, in general his sense of humor is awesome and we all giggle a lot. He's gotten really into his stuffed Tigger this month too-it used to be on a shelf on the wall in his room but he started reaching for it and then giving it all sorts of cuddles and kisses and loves so now it's just on the main floor available for him to play with whenever he wants because that's adorbs (he also loves to give his stuffed dinosaur the occasional snuggle in his room after waking but seems content to let you put it back on his bookshelf before leaving the room). Chasing James or having him "chase" you has become a favorite game, as has hiding behind a corner and then "peek-a-boo"-ing out (he's usually the one who likes to hide then pop out at you). He'll laugh and laugh (and it's the best laugh there is). And finally, he got to meet his Uncle Kevin and Aunt Emily's dog Millie (they live out of town) and this was the first time he's really spent any time with a dog. He was definitely wary at first but during dinner they made friends and James ended up purposefully feeding his food to Millie. And he would giggle whilst he did so. HOW CUTE IS THAT?! So yeah, as always, sweetest cutest baby on the planet. Nicknames: James-y, Jamesy-pie, Nugget (or Nug or Nuggy or Nuggy Nug or Nuggety or Nougat), Goofy or Goof-Nugget, Kid, Cutie McCuterson, Cuddle Bug, Snuggle Bunny, Kookaburra (because he's cooky), Mister, Sir, Bud/Buddy, Friend, Sweet Boy, Baby, Love (My love, little love, sweet love, lovey), Cutie patootie/pie, My Sweetie/Sweetie-pie, Sweet Pea, The Baby, Little/Sweet/Baby Boy (or any combo with any of the other nicknames listed-particularly Sir Baby and Mister Boy), Baby-man (Michael calls him this). Talking: He's saying sooo many things and it's getting more and more conversational. He'll respond if we ask him things, or sometimes he'll ask us something ("Who's dis?" "Where's Dad?" "Dat?" --aka "what's that?") There are a lot of words and things he will just say randomly out of the blue and then you like never or rarely hear it again, but he says "dada/dad/da" all the time (mama less so, *harumph*). His 2nd most used word is probably "ball" or potentially "bat" (Batman). He went through a phase where he was saying "book" a lot but now he just sits and holds it for you, instead. He frequently says "hi" (in the cutest little happy elongated "hiiii" way), "yeah", "no", "buhbuh"(bye bye), and sometimes "duh" for dinosaur (as opposed to "da" for dad). He's said dog, meow, woof, and really just a bunch of stuff. He's kind of amazing. Favorites: Me and Michael. His grandparents and Aunt Shannan. Dancing/singing. Cuddles. Kisses. Reading. Facetiming. Being tickled. Playing. Particular toys (especially balls). His dinosaurs. His stuffed Tigger. Blowing raspberries (making silly sounds/faces in general). Hair. Feet. Animal sounds. Running (more accurately, crawling) away from you. Attention, always. Baths. Food. Batman. Dislikes: Being changed (clothes or diaper). Staying still if he's not in the mood. Getting hurt (I hate it too.) Taking anything he wants away from him/telling him he can't have something/taking him away from somewhere he shouldn't be. Not being able to sleep. Not being paid attention to. Not being with mommy/daddy. Concerns: Not much! Little boy is so good, my only concern is just hoping he stays safe and doesn't get hurt like...in general lol. Especially with how he loves to get into everything. A Day in the Life: This month was a little weird because we spent most of it adjusting slowly to help make up for daylight savings time. But it's pretty much the same schedule we've always had, just with the times moving forward. And now that daylight savings is over it's back to norma. James wakes up around 7am and then I nurse him. We have breakfast and then play/read/spend a little bit of time with daddy before he leaves for work. I put him down for his nap around 9:30am. I get him up at 11am (or 11:30 at the latest) and nurse him. We have lunch and play and read and I maybe get a couple things done also (cooking, stuff around house, errands, etc.). He goes back to sleep between 2 and 2:30 (or at least that's when he goes down, he usually plays in his crib for a bit before he finally conks out) and then gets up anywhere from 3:30-4. I nurse him and then we have a snack, sometimes while I cook dinner. After Michael gets home we all eat together (usually like 5:3-6ish) and then have a little bit of playtime before our nightly routine (change diaper, read book, Michael dresses him and says goodnight to things around the house, reads his superhero rules we have hung up, then hands him off to me in his room). I nurse him at 7:30 and he's usually asleep and in his crib around 8ish.